The new content element in the wizard. One neat thing about it is whenever you switch the programming language the form gets reloaded to load the fitting tokenizer and syntax scripts. 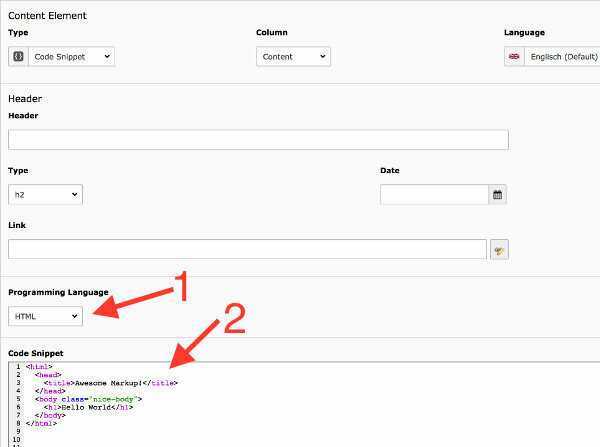 Make sure to save your form before you switch, to not risk to loose any code snippet content. 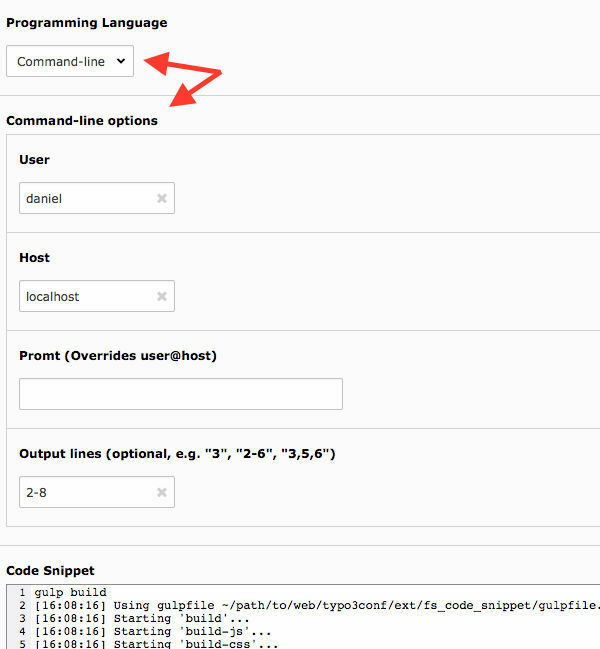 The fields user, host, promt and the information what lines are output instead of input are stored in a FlexForm that is only visible if "command-line" is selected from the programming language dropdown. Preview of the configuration for the command line option. # Notice: "styles." (and "temp.") objects are UNSET after template parsing! # Use "lib." for persisting storage of objects. Please let me know what is missing or can be improved here, so one day we can open a merge request to add typoscript to the supported languages of prism.js. // Add the CType "fs_code_snippet"
We basically configure two fields here: programming_language as a select from the constants of the CodeSnippetLanguage enumeration class (check out TYPO3s implementation of the enumeration type ). Noteworthy is the addition of the field to the requestUpdate fields of tt_content. This ensures the form is reloaded if programming_language is changed, so the fitting tokenizer can be loaded. The most interesting part ist the render() method, that maps the content of the programming_language field dynamically to the mode of the T3Editor and if it is an unsupported mode falls back to the mixed mode. Additionally all supported languages are added. They are stored in an enumeration as mentioned above. * Process data for the CType "fs_code_snippet"
And with this it should be possible to add more programming languages to the extension. This would work best if you copy the bower.json, .bowerrc, package.json and the gulpfile.js to your own extension and execute the build there. Then just overwrite the include of the JS file of fs_code_snippet with your own file and you should have python support in the frontend.